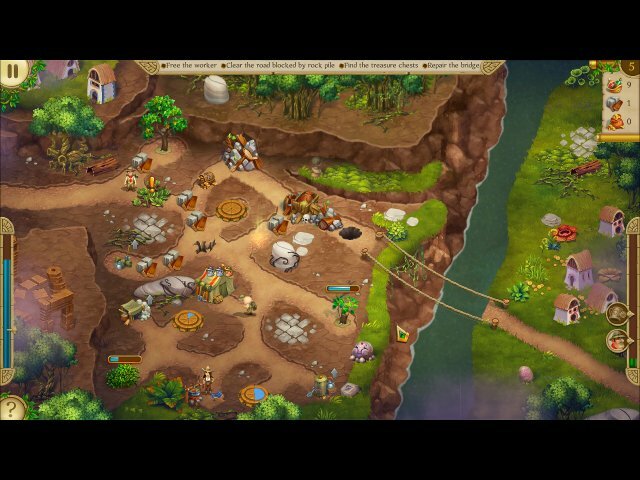 Here you can download the game “Alicia Quatermain and the Stone of Fate” on your PC without registration and for free. To download the official version of the game on the computer is very simple, you can do this by clicking the button Download Game. You can get the key to the game “Alicia Quatermain and the Stone of Fate” after starting the game by clicking the button Remove the time limit. It’s not easy living up to your namesake. Just ask Alicia Quatermain, granddaughter of the famous world-traveling explorer Alan Quatermain! Adventure runs strong in her veins, and destiny calls in the form of a rare and powerful artifact in Alicia Quatermain and the Stone of Fate. Legend says the Stone of Fate will grant mighty power to its owner. Now Alicia Quatermain sets off on a quest from the jungles of India to find it. But her journey won’t be easy — strategy and time management are both vital components in how successful her expedition will be. More than jungle thicket will stand in your way in Alicia Quatermain and the Stone of Fate. A nefarious secret organization also has its sights on the artifact, and will do anything to stop Alicia. How far are you willing to go in the name of adventure? Can you overcome all the obstacles that stand in your way? Explore 55 challenging levels, each with its own unique tasks and trials. Avoid traps and pitfalls. Steal an aircraft from the secret organization. Find and explore a mysterious town tucked away in the Tibetan mountains, and even survive deserts without water and avalanches on snowy peaks. Alicia Quatermain 3: The Mystery of the Flaming Gold. Вы хотите знать Ваше будущее?